When I was young I used to enjoy cleaning our families crystal chandelier which was hanging in our sitting room. It would take me hours to remove each piece, soak in hot water, dry and hang them back up. There were probably 50 pieces in total, but I would get the biggest kick from bringing the sparkle back to those dusty crystals. 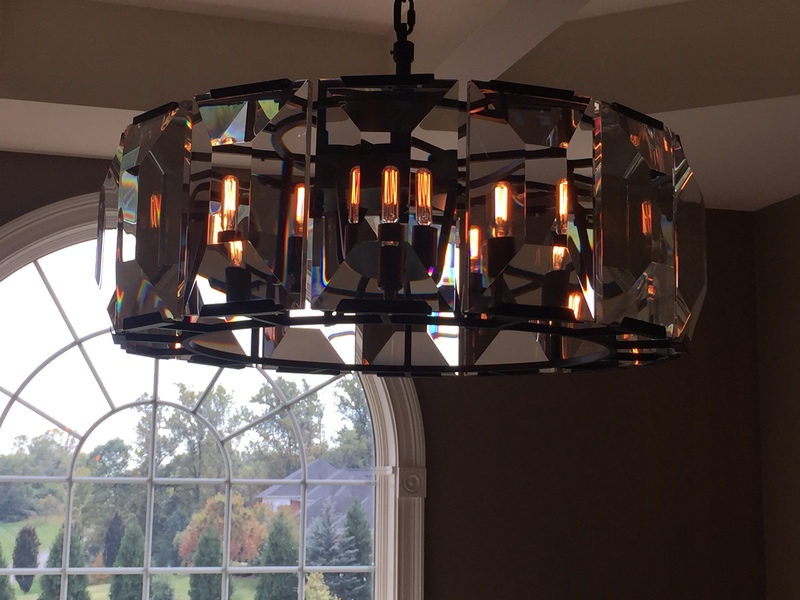 Lighting styles have definitely changed since my childhood, but I still love the look of a sparkly crystal chandelier hanging in a room. But I don’t love the look of dirty crystal, you know the type, that milky cloudy look that encompasses the glass. Our dining room chandelier has that look now, the sparkle is gone and that milky residue is prevalent. But the crystals are large and heavy, removing each piece is not a viable option. So how do the experts clean crystal? How does Restoration Hardware make their chandeliers sparkle like mad? Their crystal is totally smudge, dust, and lint free. During a recent shopping excursion, I asked the staff at Restoration Hardware, how do they get their crystal chandeliers to look so sparkly? Yes the chandeliers themselves are gorgeous but the ones in their galleries are particularly perfect. The answer… white gloves! Huh? Excuse me? White gloves? What do you mean? Please show me 🙂 I asked the very nice saleswoman to show me these gloves online. Ingenious…. and it alleviates the need to remove the crystals from the light. I am definitely going to check this out. I went home and ordered these gloves HERE along with a bottle of Perfect Glass HERE and tested it out. This is my milky looking crystal chandelier before cleaning. Can you see the film of a cloudy substance, this film drastically reduces sparkle from the light. I recommend turning off the light to clean your chandelier, but I was doing this at nighttime. Using the gloves, one on each hand, spray the glass cleaner on one of your gloves, not the chandelier. Starting from the top and working your way to the bottom, carefully wipe each crystal with the sprayed glove and then immediately dry the crystal with your clean glove. The idea is to keep one glove lightly sprayed and the other one dry. Be very careful not to spin the chandelier and that your ladder is very stable. You can also clean the frame and the links with the dry glove, I don’t recommend using cleaning solution on the frame or links. It’s a good idea to also clean the bulbs by wiping with a damp cloth to remove any dust particles. The pack I ordered came with 16 pairs of white gloves, which is very handy considering it will take more than one pair to do a proper cleaning. This picture shows the comparison of two crystals, the right one has been cleaned, the one of the left side is still cloudy. Another picture showing a clean and dirty crystal…big difference! I sprayed one glove each time I cleaned a new crystal and circled around the light, being careful not to spin the chandelier. After I cleaned each piece with a wet and dry glove, I used a clean pair of dry gloves to once again wipe each crystal, removing any remaining smudges. I have to say, that I’m really pleased with this method of cleaning. It didn’t take long at all, was easy and the results are extraordinary. This is the best my chandelier has ever looked. This is a picture during the day with the light off, I can’t believe the difference! Thanks for stopping in, and see you next time! That is an amazing tip that I never would have guessed! Thanks for sharing! Isn’t it?! I thought so too, hope it helps you.